I got at my review Epson Home Cinema 1060 vs Epson Home Cinema 660. So, Epson Home Cinema 1060 is mid-price segment projector for a home theater. Thanks to the widescreen Full HD resolution I could install the projector in different positions and the image remained excellent. However, for the perfect image, I had to calculate the distance to screen. In my situation – 8-12 feet for the 120’ screen. 3LCD technology allows me to watch any movie without a rainbow effect. Epson is compatible with most devices. I could connect my PC and Mac at the same time in two HDMI inputs. Black color is not a real black. I wanted to have really deep black and could not achieve that with this projector. Epson 1060 is so loud at regular power mode. The cooling fan creates a lot of noise when working. No audio output. The built-in speaker is good, but as for me, it is not so loud and lacks depth of the sound. 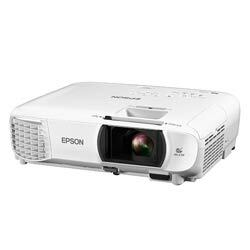 As part of my review Epson 1060 vs 660, I would like to speak about Epson Home Cinema 660. It is a good home projector with native resolution 800X600 and contrast ratio 15000:1. I installed it in my home theater and have good picture on my 120’ screen thanks to the great color rendering. 3300 lumens of brightness. I got the bright image even in outdoor movie watching. Epson 660 is a compact projector. Thanks to good design, it is really easy to take this projector with me to my friends. Epson 660 has not audio output. Does not support Full HD. On the big screen, the image is not enough sharp and crisp. The projector has not zoom capability. What to choose — Epson 1060 versus Epson 660? Now I can start to compare Epson 660 vs 1060. If you need a good stationary projector for a home theater with an excellent image with widescreen support, your choice is Epson Home Cinema 1060. In comparison with Epson 660 it has sharper image, but it is less bright. If you need a compact and portable projector, you'd better choose the Epson 660. Compared to the Epson 1060, Epson 660 is brighter and quieter, but it has lower resolution and less detailed image.